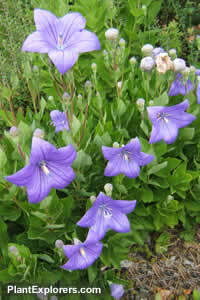 This compact perennial has blue-green leaves borne in whorls on the lower stem, alternately higher up on the stem. Bears clusters of balloon-like buds that open to 5-petaled purple-blue flowers with dark blue veins in late summer. Height 24 inches. For maximum freshness, please keep seed refrigerated in its original packaging until it is time to plant. Sow seed where it will grow or in containers in spring. Grow in deep, fertile, loamy, reliably moist but well-drained soil in full sun.